Vgo... High Dexterity Touchscreen Goatskin Leather Winter Warm Work Gloves have breathable and stretchy genuine goat grain leather provides hands maximum comfort and excellent grip. Two layers stretch-spandex back with polar fleece, G200 thinsulate and TR2 lining for coldproof, also add breathable waterproof membrane. Pre-curved fingers for great fit. Extra long cuff design keeps hands from cold wind. 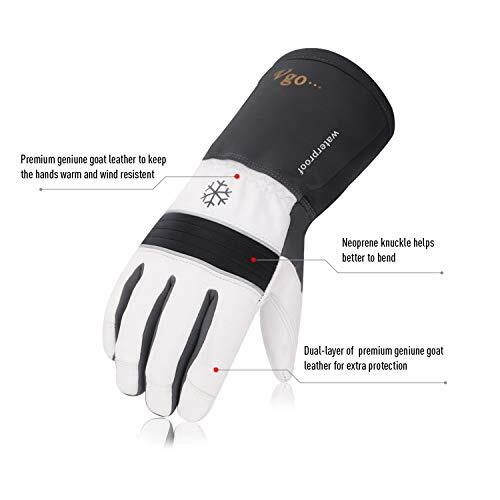 Lock clips and vent hole design, humanized design to keep gloves together when you are not wearing them to prevent losing.